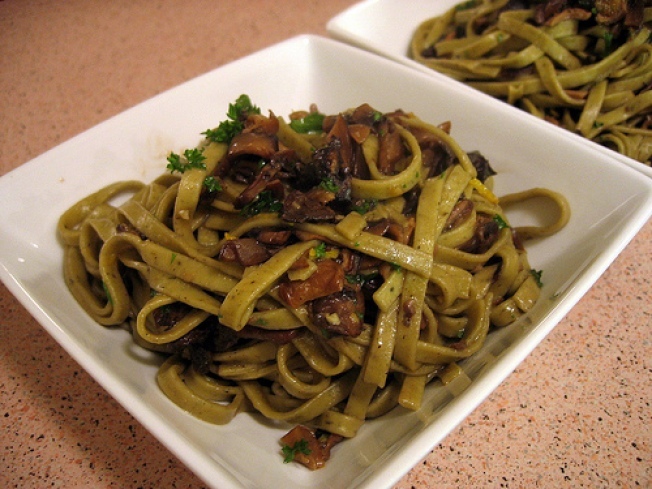 Spinach fettuccine with wild mushrooms is easy to make and it tastes great. Pasta with mushrooms is about as versatile and easy as cooking can get. That being said, some versions are better than others, and every few months or so, I try a new combination of ingredients. This variation, featuring spinach-flecked egg fettuccine and a mix of fresh and dried wild mushrooms, has become one of my favorites. With fall right around the corner, it’s the perfect weeknight dish to usher in the new season. 1. Soak dried mushrooms in boiling-hot water in a bowl until softened, about 20 minutes. Drain and reserve soaking liquid. Finely chop dried mushrooms. 2. Heat 1 tablespoon butter in a large heavy skillet over moderately high heat until foam subsides, then sauté fresh mushrooms with garlic, salt, and pepper, stirring occasionally, until liquid mushrooms give off is evaporated and mushrooms are browned, about 5 minutes. Stir in chopped soaked mushrooms and reserved mushroom-soaking liquid and simmer one minute, then remove from heat. 3. Cook pasta in a large pot of boiling salted water until al dente, about five minutes. Ladle out and reserve 1/4 cup pasta cooking water. Drain pasta in a colander, then add it to mushrooms in skillet. Add remaining tablespoon butter and cook over moderately high heat, tossing and slowly adding pasta cooking liquid if to lightly coat, one minute. Add parsley, lemon zest, and juice, then toss. Sprinkle with cheese and pepper to taste and serve.